Yotel has opened its second US location in Boston’s buzzy Seaport District. Inspired by first-class airline travel, Yotel Boston features smartly designed cabins, a technology-driven guest experience, clever social spaces for co-working, relaxing and socialising. The new Boston hotel will also introduce the city’s newest indoor/outdoor rooftop bar and terrace, Sky Lounge. Hubert Viriot, chief executive, Yotel, said: “We are thrilled to introduce Yotel to Bostonians and visitors alike. “The exciting development of the Seaport neighbourhood is a great fit for our brand, making it the perfect location for our newest property. 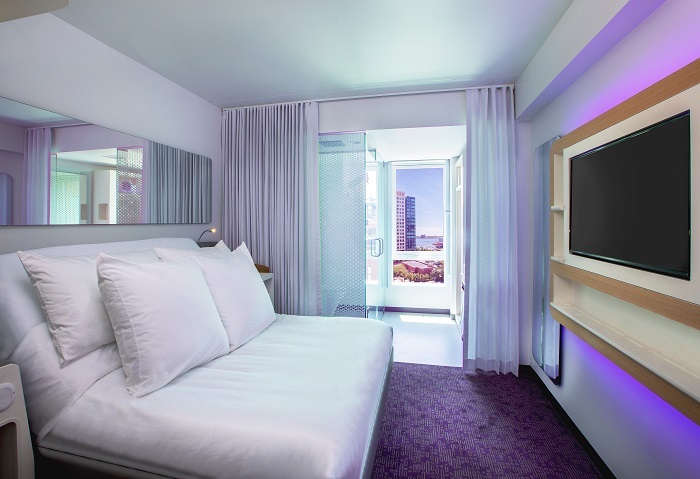 In keeping with its tech-savvy neighbourhood, Yotel Boston provides a seamless technology-driven guest experience that simplifies the customer journey. At Mission Control, guests can check in with the hotel’s airline-style self-service kiosk in under a minute or simply use the Yotel app for keyless cabin entry. In addition, super-fast and free Wi-Fi is available throughout the property. Yotel Boston’s ‘cabins,’ are created with the guest experience in mind - giving them everything they need and nothing they don’t. All 326 cabins present the essential elements of a luxury travel experience in smart, sleek spaces. The new Boston hotel will welcome guests and Bostonians alike to its social spaces, ideal for co-working, casual meetings, social gatherings and cultural programming. Christopher Hartzell, general manager of Yotel Boston, said: “Staying at Yotel gives guests back their time to enjoy what’s important to them. Yotel Boston is owned by Wheelock Street Capital and located in the Seaport, an area known for its booming technology scene, luxury high-rises and indie artist community. It sits across the street from One Seaport Square, the sprawling mixed use retail and residential project in development and steps from Boston Harbour, the Financial District, Boston Convention & Exhibition Centre and the Institute of Contemporary Art.